Vishal Sikka has resigned as Infosys CEO and MD, a little over three years after joining the company as its chief executive on 18th August 2018. Long-time executive and COO U.B. 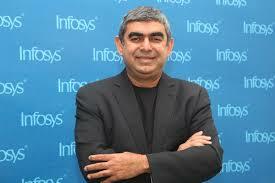 Pravin Rao has been appointed the interim Infosys CEO as Vishal Sikka resigned with immediate effect. A former SAP top executive, Sikka joined India's second biggest software exporter in June 2014 in an effort by the company's board to infuse fresh blood at the top after co-founder S.D. Shibulal's term as chief executive ended. Despite giving up the post, Sikka will remain associated with the company in the capacity of Executive Vice Chairman. Mr. Sikka cited among his reasons for leaving “a continuous stream of distractions and disruptions over the recent months and quarters, increasingly personal and negative as of late, as preventing management's ability to accelerate the company's transformation,” according to the statement. N.R. Narayana Murthy, founder of Infosys, over the past couple of months, has raised issues of corporate governance and salary increases paid to Mr. Sikka and chief operating officer U. B. Pravin Rao. Mr. Murthy also wanted to make public a report on the investigations on buying Panaya for $200 million. The Board understands and acknowledges Mr. Sikka’s reasons for resignation, and regrets his decision, the statement said.